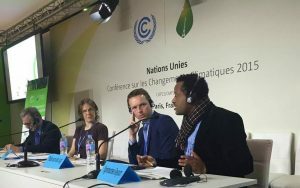 A panel of experts, policy makers and development professionals met at COP 21 in Paris to look at emerging new inputs to the Global Assessment of Bamboo and Rattan. 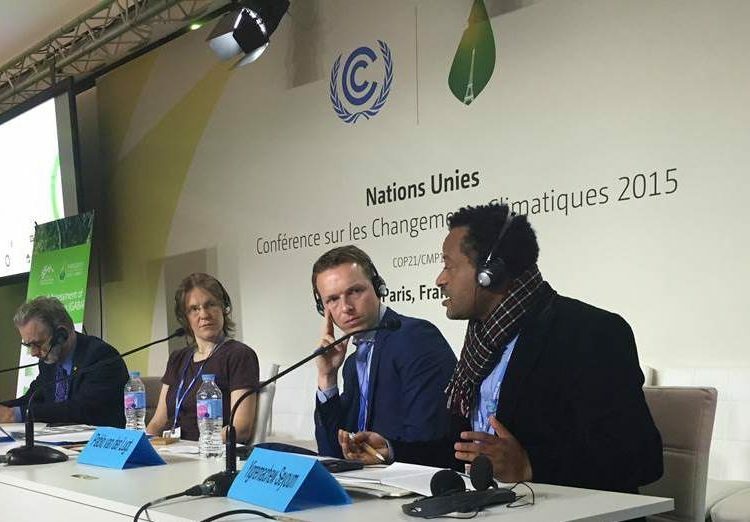 In a special session at COP 21 in Paris, experts from INBAR, Kew Botanic Gardens, Ethiopia, the International Fund for Agricultural Development (IFAD), and bamboo producer, MOSO International, explored a series of new inputs to the upcoming knowledge base of GABAR — the Global Assessment of Bamboo and Rattan. Results of a carbon footprint lifecycle analysis of bamboo products were presented, the draft of a global checklist of all bamboo and rattan species was introduced, and an overview of past results of INBAR livelihood projects supported by IFAD was discussed. From right-left: Dr. Yigremachew Seyoum Lemma (Ethiopia), Dr. Pablo van der Lugt (MOSO International), Dr. Maria Vorotsova (Kew), and Dr. Hans Friederich (INBAR). As it takes shape, GABAR will provide countries and the global development community with knowledge on all aspects of bamboo and rattan development. While the benefits of bamboo and rattan are generally recognized, they are not necessarily being included in many countries’ climate change plans as strategic resources. This is due to poor availability of useful data, a lack of coordination between experts and agencies, and the fact that technical and practical information on bamboo development is not readily available. Planned as a $100 million programme, GABAR is designed to reverse this handicap, increasing access to all useful information on bamboo and rattan development and presenting the evidence countries need to create jobs, generate local income streams, and reverse land degradation and deforestation. The Assessment is a partnership between INBAR, its 41 Member States, and a range of national and international partners. How many Bamboo and Rattan Species exist in the world? One critical input to GABAR is the planned ‘Global Checklist of Bamboos and Rattans’ – providing a comprehensive list of known species and locations worldwide. Compiled by Kew Royal Botanical Gardens and INBAR with China’s International Center for Bamboo and Rattan (ICBR), it is currently under review by a panel of taxonomists with expert knowledge on bamboo and rattan in the world’s regions. When completed, in early 2016, the checklist will present the state of bamboo and rattan species as agreed between a panel of world experts. This will be a ‘living resource’ continually updated as knowledge of these species evolves. The Checklist will clarify how much bamboo and rattan exist in the world and where it is located; what the species are; their agro-ecological characteristics; water and nutrient requirements; and options for propagation and the creation of new bamboo plantations. One of the lead authors, Dr. Maria Vorontsova, a taxonomist from Kew Botanic Gardens in the UK, summarized the taxonomist’s dilemma, and the value that the Checklist will bring to the bamboo and rattan world: “some of the most commonly found bamboo species in some countries, such as Madagascar, do not even have a scientific name.” But, with more complete information and baseline diversity inventories, she argued, that species could be more effectively targeted for development activities such as land restoration, soil protection, and the production of renewable energy. The promise of bamboo and rattan for rural communities was highlighted by Margarita Astralaga, Director of IFAD’s Environment and Climate Division. She stressed the value they bring to climate change mitigation/adaptation strategies. IFAD has contributed $6.6 million to INBAR projects over the past two decades, including: the development of small and medium-sized bamboo and rattan enterprises that generate jobs for disadvantaged groups; bamboo charcoal schemes that provide a clean and renewable source of bio-energy; and efforts to strengthen the capacity of bamboo and rattan producers. This project work lives on in many communities in India where INBAR demonstration projects have been taken up by local development NGOs, resulting in increased income and improved livelihoods for hundreds of rural communities. Most recently the fund has supported an initiative that transfers India’s bamboo expertise to Tanzania, Ethiopia, and Madagascar. The advantages of bamboo are well recognized in Ethiopia where the plant is being used to restore degraded land. Dr. Yigremachew Seyoum Lemma, Director of Forest Strategy and Planning in Ethiopia’s Ministry of Environment and Forests, outlined the government’s ambitious plan to restore up to three million hectares using bamboo – part of the country’s commitment to the Bonn Challenge, the global land restoration initiative. The emerging GABAR knowledge base will be a much-needed source of validated and practical information that low-income countries can use to develop their bamboo and rattan economies. As more evidence becomes available through GABAR, countries and development partners can use this resource to inform their climate action plans – so that bamboo and rattan are included when the COP21 agreement comes into force in 2020. Outputs: resources, case studies, maps, practical tools, and data. Outcomes: more effective use of bamboo and rattan in national green economy plans and development agendas. Increased investment in these resources by countries, donors, and development partners. Impacts: a better world, improved livelihoods, income and environmental security on a huge scale in bamboo and rattan resource countries. • Knowledge and tools – reports, studies, useful packaged data. • China’s State Forestry Administration will lead a national inventory and assessment ($3 million earmarked), and supports INBAR with an annual core contribution. • Ethiopia’s Ministry of Agriculture will assess bamboo’s potential for land restoration through its Sustainable Land Management Programme, and is starting a national bamboo programme. • The International Fund for Agricultural Development is working with INBAR on national assessments of bamboo for energy and livelihoods in Africa, through South-South collaboration, with support from China and India. • Sharing and synthesis of experience on bamboo and rattan development. From forest to femur: Rattan for bone replacement?